This is hands down the best bird feeder project we’ve seen yet. I got an email from the folks at Manifold, a creative design agency in San Francisco, this week. One of their developers works from Denver, Colorado, and has been spending some time building the ultimate bird table. It’s autonomous, it’s solar-powered, it feeds, it photographs, it tweets images when a bird comes to feed, and it’s open source. A PIR (passive infra-red) sensor detects when a bird lands at the table to feed, and triggers the camera. Photographs are then uploaded to Twitter. PIR’s a great choice here because it only responds to warm-body heat; if a leaf blows in front of the assembly, nothing will trigger, but if a toasty-warm little bird stops by for some seed, the sensor will detect it, and set off the camera. This was not a trivial build. Issues like waterproofing, power constraints, and all those fiddly annoyances you find with outdoor projects had to be dealt with. The prototype (built from the ground up out of bits of wood: no pre-made bird feeders for these guys) took around 25 hours to put together. Here’s a time-lapse video of what happened in the workshop. 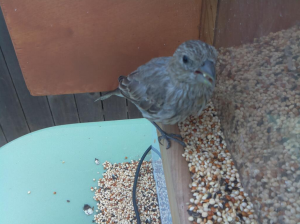 The first iteration of the Tweeter Feeder had a few bugs: the webcam in the assembly didn’t offer high enough resolution for decent pictures of the birds, and was swapped out with a Raspberry Pi camera board. But the camera board’s focal depth wasn’t right for this project, so an additional lens was put into the assembly – and then all the camera code had to be changed to reflect the switch. With cracking results: here’s a before and after picture. The PIR sensor was getting false positives from changes in temperature due to the sun on the feeder: an additional motion sensor was added to iron those out. A light sensor found its way into the assembly to stop the camera triggering when there wasn’t enough ambient light for a reasonable photograph. The solar panel positioning wasn’t optimal. And so on and so on – but the bugs have all been stomped now, and the end result is a thing of beauty. Read Chad’s account of what they were up to on Manifold’s blog (which has a ton of information on the development of the Feeder Tweeter), and then head to the Feeder Tweeter site itself, where there is an area for developers with a hardware list, wiring diagrams, links to all the code you’ll need on GitHub and much more. And let us know if you decide to make or adapt the Feeder Tweeter for your own use – we’d like to see what you come up with! Not sure what frequency this ultrasonic range sensor is using but i think that bird and some other animals can hear the ultrasound and can be affected by it. It’s not ultrasonic, it works by detecting variations in infrared (heat) radiation. The sensor is triggered by the body heat of the bird moving in front of it. They went through many iterations. They found PIR to be unreliable when there is sudden changes of temperature (sunrise / sunset). The final version uses the PIR and an ultrasound module to confirm motion. And a photocell to detect that there’s enough light to take an acceptable photo. Lots of trial and error! Good to read such a detailed journal of their development. They mentioned wanting to use motion detection- they don’t seem to realize that there is a version of motion (motion-mmal) that does work with the R-Pi camera. He is using Twitter as a totally open RESTful server. which is fine, but probably not what twitter expected. Nice project. I wonder where in Colorado because Boulder has been hammered by rains this past week. Reading the blog, PIR isn’t for leaf detecting purposes, and it still has random error, necessitating a second verified detection system. That solar charger system is interesting because I doubt that the system has “low voltage” warning to do proper shutdown before running out of juice. It is what always stopped me when trying to do such project. Now the proper tweeters can get on Twitter! The camera improvements are pretty impressive, but I doubt the birds could give a twit about the ultrasound. Maybe it would keep barking dogs from disturbing the birds. Great project and documentation! I don’t get why “all the camera code had to be changed” because of adding a correction lens? If I put on reading glasses I can see clearer at short distance, but otherwise what I see is the same. Because they switched from a webcam to a Pi camera board, not because of the lens!